​Following the defeat in the Guadalcanal campaign, at the beginning of 1943, the Navy Technical Department of the High Command of the Imperial Japanese Navy strove to increase the defensive potential of all their warships. Apart from standard refits of the marjority of the Imperial Japanese Navy units, a plan was adopted, which called for construction of two "Takao" class heavy cruisers into anti-aircraft units. 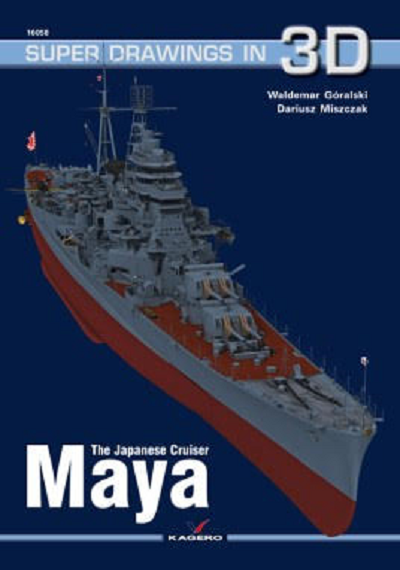 Through a coincidence only the Maya underwent such conversion This publication shows the cruiser in her anti-aircraft configuration and briefly describes her career. Kagero Publishing is based in Lublin, Poland. The book is in English. It comes in a self-sealing clear envelope. It contains 80 pages in 8" x 11 3/4" page format. It includes a pair of cardboard goggles that have one blue lens and one red one to use to see the illustrations in 3D. There are 145 color 3D illustrations in the book (including the ones on the front and back cover that show the Maya from above the bow and above the stern. There is a large 24" x 19" sheet with black and white line drawings on each side, folded twice to fit inside the book. One side has 2 side views, top view, sern view and a bow view in 1/350th scale. The reverse side of the sheet shows each section of the Maya as large illustrations to no particular scale. The last page of the book has no less than 63 color cover arts of other books that Kagero publishes. This book will be of great interest to naval historians and plastic modelers alike. I wish to thank Casemate Publishing, the N.American distributor for Kagero books and also the folks at Kagero for this review sample.